The next Center City District Restaurant Week starts in less than two weeks! From January 18-23 & 25-30, 2015, participating restaurants will offer three-course dinners for only $35 and three-course lunches for $20. Get the full list of restaurants at CenterCityPhila.org/RestaurantWeek. While on the site, you can also make easy online reservations through OpenTable and enter a contest to win 52 gift certificates from Center City restaurants. Enjoy daily open skating at the Rothman Institute Ice Rink or brush up on your skills with four-week Learn-to-Skate lessons on Sundays! Plus, it can be rented for parties and special events. 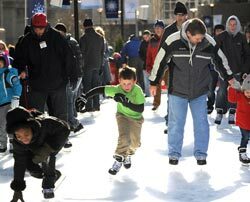 Get regular and holiday hours, prices, rink rentals and group rates at DilworthPark.org/rothmanicerink/. Greenlimbs.com, a local site dedicated to sustainability, is helping residents get rid of their Christmas trees and holiday greenery with Treecycling. On January 10, bring your bare (free of ornaments, metal, stands, etc.) trees and greens to four collection sites near Center City to be recycled into mulch. There is a suggested $5 donation per tree and a $2 donation per wreath. Visit GreenLimbs.com/event/treecycling/ for collection sites and details. Come to the Trinity Center for Urban Life on January 8, 7-9pm, for The Psychology of Achievement: Grit, Curiosity and the Hidden Power of Character, a lively lecture and interactive discussion, sponsored by Center City Residents’ Association and Penn Medicine. Hear about concepts crucial to success and how to incorporate them into your child's life as well as your own. Presented by David Meketon, award winning educator and research liaison with Angela Duckworth at the University of Pennsylvania. Join KYW on January 9 for a live broadcast of Reporters Roundup at The Shops at Liberty Place. Your favorite KYW reporters will take the stage in the Rotunda. The show begins at 12pm. From January 17-19, Eastern State Penitentiary will commemorate Dr. Martin Luther King, Jr. and his 1963 “Letter from Birmingham Jail” with special readings from the landmark text, and opportunities for visitors to respond. Professional actors will read excerpts from King’s letter three times a day on Saturday, Sunday, and Monday at 11:30am, 1:30pm, and 3:30pm. An informal Q&A moderated by a civil rights scholar follows each reading. The readings are free and open to the public. Free tickets are required and available online at EasternState.org or at the door, subject to availability. Paper Source requests the honor of your presence at an all-encompassing workshop on weddings and special events on January 17 at 11am! You'll get a packet containing a full suite of Luxe white invitation pieces, along with a wedding planner and checklist. Paper Source will provide an overview of their invitation suites, share ideas for favors, place cards and accents from event inspiration boards and then demonstrate how to make several samples. Learn to mix and match colors - including stamping, embossing and envelope lining - to help you create your ideal invitation. You'll leave armed with all the knowledge to create the event of your dreams. Customers will receive a coupon for 10% off purchases after every workshop. (Discounts cannot be used in combination with other discounts or with custom orders.) This workshop has limited seating, so RSVP soon. There is a $20.00 registration fee.